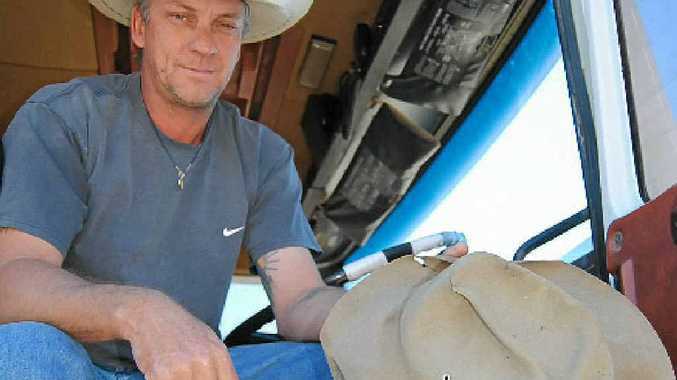 WHEN BiG Rigs saw friendly truckie Tony Jarmey on June 7, he was trying on his brand new hat while sitting in the driver's seat of his Volvo F10. The 42-year-old Tony carts road construction material and his company name is T&K Tipper and Tanks. "The Volvo is a 1985 model and is good for the work. I have been down at Bowen for the past 18 months," he said. Some years ago Tony used to run road trains between Townsville and Mount Isa and also drove trucks with acid to Darwin. "My favourite roadhouse would have to be the Lights On the Hill at Hughenden although I haven't been there for some years," he said. His hobbies include fishing in his small boat around Magnetic Island and helping his sons aged 10 and 12 with their pet horses. "They want to end up competing in rodeos," he said.